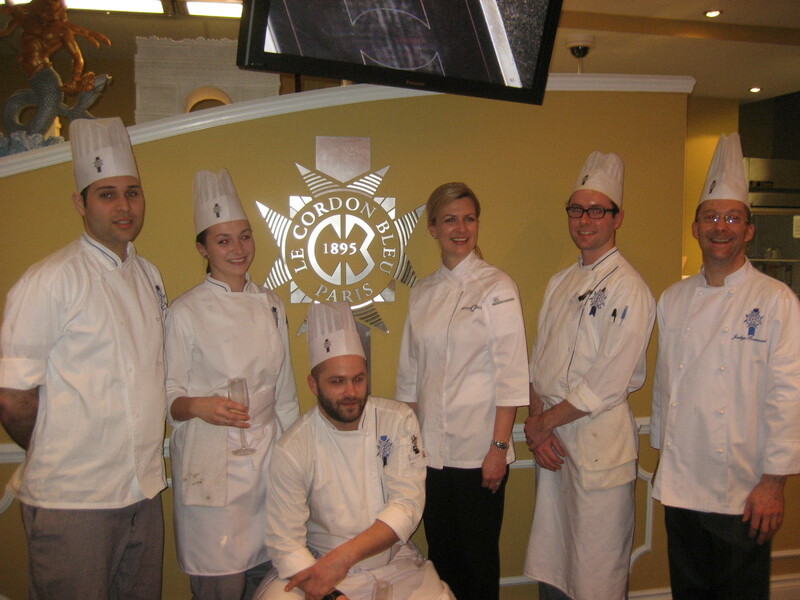 This past weekend I had the opportunity to take a short course/demonstration class at Le Cordon Bleu in Ottawa. 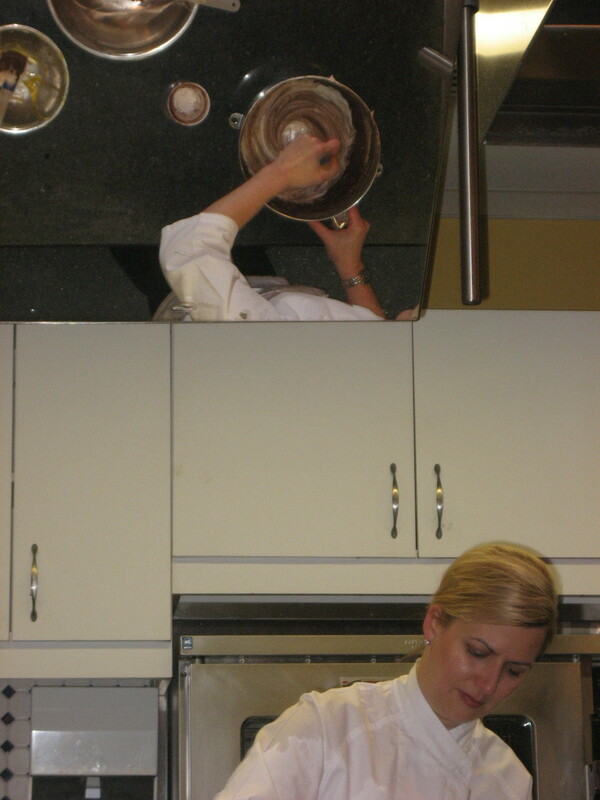 Anna Olson, my favorite Food Network Chef, was there to teach a class on Warm Winter Desserts. I just could not pass up this unique opportunity to attend a class at Le Cordon Bleu and especially with a chef I admire so much! I arrived at Le Cordon Bleu a little early and drank in the beauty of not only the building, but the interior restaurant, classrooms/kitchens and just the excitement and awe of being inside this world renowned culinary institution. 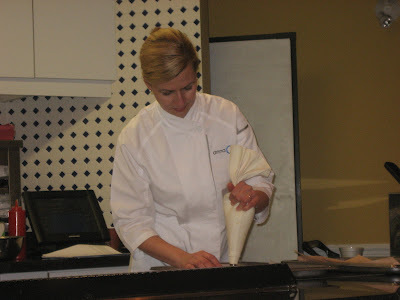 Chef Anna Olson is as personable and down to earth as she is on television. Since I watch her show regularly I felt like I was spending an afternoon with my longtime friend. Anna and the chef of the Ottawa Le Cordon Bleu school as well as four student chefs were in the classroom/kitchen setting up and greeting us, their afternoon students, as we arrived. Anna warned us there would be a test at the end of her class..........a taste test! 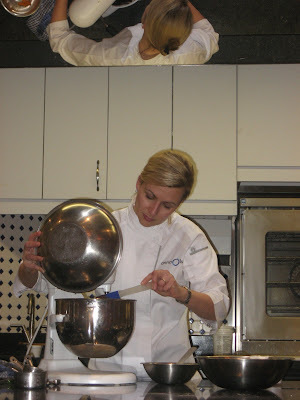 Anna prepared three different desserts in the short timeframe of the course, all the while answering questions on a variety of culinary topics. I took notes as fast as my pudgy fingers could write. While she prepared the desserts, chemestry and technique were key points of her presentation. In a culinary classroom you are not presented with a "...add 2 cups of flour and 1 cup of sugar" type of education. We explored the whys and hows and wherefores of the chemical reactions with not only the ingredients, but also the types of utensils (such as baking pans or sheets) you use. In addition, how flavors develop or, how to develop flavors more prominently depending upon the foods you are preparing were discussed. Being able to watch above in the overhead mirrors as well as straight on allowed the class to actually see the incorporation of ingredients as the correct blending and texture took place. what DOES the egg yolk do, the egg white, the combination of both and when to use one or the other, or both. The makeup and weight of the egg and how to substitute for those who cannot eat egg without changing the flavor and texture of your food? differences in (for example) pie plates. When do you use (with best results) a glass plate, metal plate or a beautiful ceramic pie dish and why it does make a difference. When the class was over, the chefs presented us with a champaign and hors d'œuvre meet and greet and photo opportunity. In addition to the champaign and hors d'œuvre, we also enjoyed each of the three desserts that Anna had created in front our eyes. Oh my...we were on a chocolate high by the end of the afternoon. And the hors d'œuvre that the students of Le Cordon Bleu had created were beautifully presented and tasted devine. Such a variety of unique creations. Have you been watching the new cooking show "The Taste"? Well, that is how these were presented to us. In addition to all of the actual culinary discussions, Anna also kept us in stitches and fascinated about the behind the scenes information with regard to what goes into a television cooking show, how it is filmed, hysterical anecdotes that you don't always see on your tv set. I wasn't sure if we could take photos when I left for the class so I didn't take my "good" camera with me. I did remember to tuck my little pocket Elph camera in my purse "just in case." As it turned out, taking photographs was welcomed, so we all snapped away. Sadly, my photos didn't turn out as well as I wish they had. I'm sharing the best of what I could salvage. 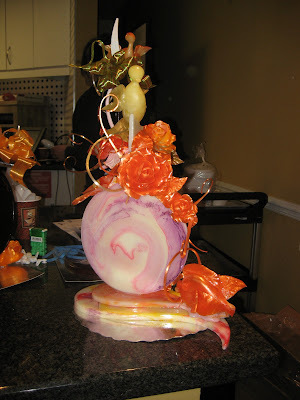 The photo (above) is one of three incredibly amazing and gravity defying sugar creations that students at Le Cordon Bleu had created. I am sorry you cannot see the detail of this sculpture. It is amazing. And what's a delightful afternoon out and about without a little shopping, eh? Yes, there was a Le Cordon Bleu Boutique. You KNOW I couldn't leave the institute without picking out a few souvenirs from my day. One item I purchased that isn't pictured is a silicon baking mat. I'm eager to try it out. 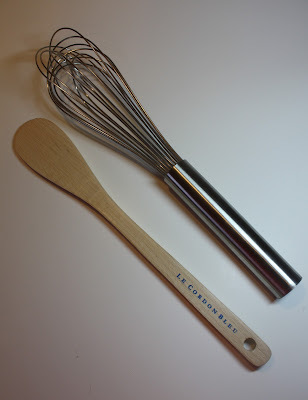 Perhaps I'll make The Mister some cookies this afternoon. All too soon it was time to leave a most memorable afternoon and experience. I took away so much information from this course and had so much fun too. 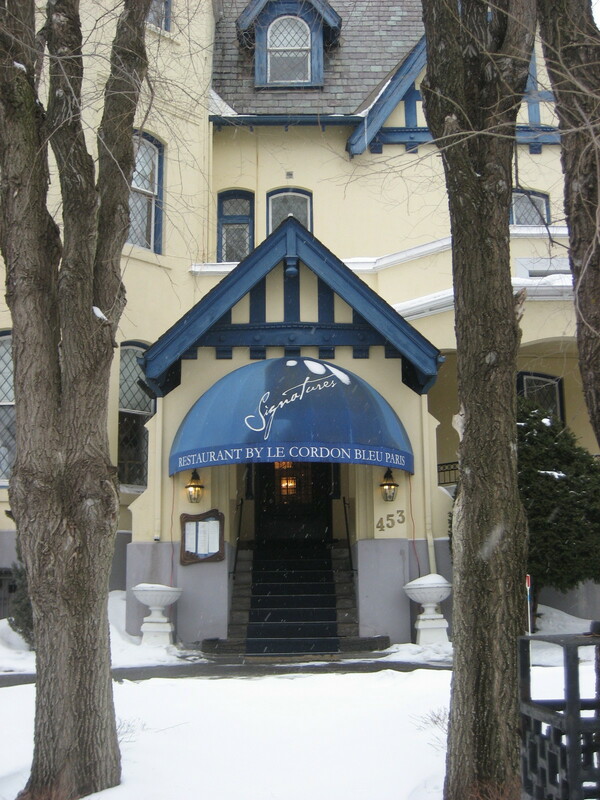 As you can see from the photo, Le Cordon Bleu has a restaurant inside the school too. One day I hope the Mister and I can get reservations to eat there. Le Cordon Bleu has a fascinating history and is now located in countries all over the globe. In addition to the main full time courses of study, they do offer short courses spanning anywhere from one to three to seven full day courses as well as the 2 hour demonstration courses. 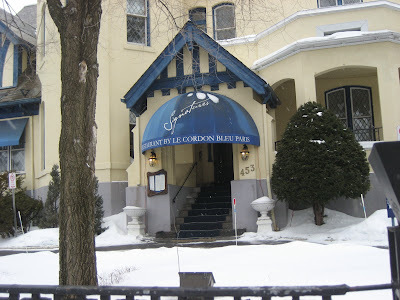 If you live in an area where a Le Cordon Bleu school is located (the Ottawa Le Cordon Bleu is the only one located in all of Canada) I would encourage you to check out what is available. I was chatting with a woman who told me that in a couple weeks she will be taking her 8 year old son to a special children's course that is being offered during spring break. What an awesome opportunity for young children! 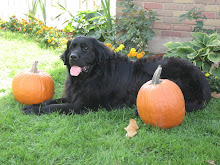 I will most definitely be making The Mister one of the desserts that Anna Olson prepared for us. Perhaps you'll see it here on my blog next weekend for what's under the cake dome Sunday. Wahooooo!!! 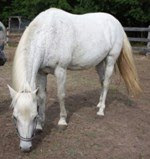 Jennifer, I am so envious of your wonderful excursion. The desserts looked divine! I had the oppurtunity to meet Anna Olson a few years back and I agree with everything you say about her. She really is down to earth. Wow, what an opportunity. I can't wait to see the results of your lessons. Yummo.